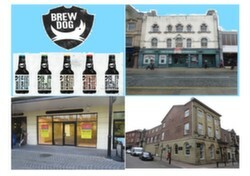 Retail surveyor, Ben Blain has secured one of Carlisle’s most exciting leisure lettings for the last decade in the city by concluding a deal to Brewdog who will shortly start fitting out 36-38 Botchergate. The Scottish Craft Beer Company were founded in 2007 when two friends started their own micro-brewery business before opening their first bar in Aberdeen from 2010. Today, the company trades from approximately 50 bars worldwide and has a presence throughout major UK cities, Barcelona, Sao Paulo, Helsinki plus many more. Carlisle joins Brisbane and Reykjavik on the shortlist of new openings! The company are intending to be open well in time for Christmas. Elsewhere in the city centre, Ben has let Unit 4 Carlyle’s Court (former Turnbull’s) to Moduals who are opening their second store selling menswear items and a wide range of adidas trainers. The company currently trade from Dumfries and felt that an additional store here in Carlisle was an opportunity to be taken. Sticking with Carlyle’s Court, following a recent change of use from offices to fitness studio, Office Suite 3 has been let to Fairy Bod Mother. The company was established in 2010 by Kim Harkness and will shortly be opening offering a variety of fitness sessions including; spinning, interval training and a mother & baby class.